After spending lots of time playing LEGO Duplo (mostly trains) with my kids and also building some larger layouts myself I got few questions regarding (mostly) design of Duplo tracks. I asked them at Polish LUGPol forum but some were not answered (it seems LEGO Duplo is not popular enough) so I’m reposting them here hoping for larger audience and thus better answers. I believe that LEGO parts (which includes Duplo tracks...) are done carefully and decisions are unlikely taken without evaluating many issues. So the radius used for curved tracks must have some reasons behind it. I don’t know which and I would very much like to know. Since I already know much of troubles caused by that choice. Read further. 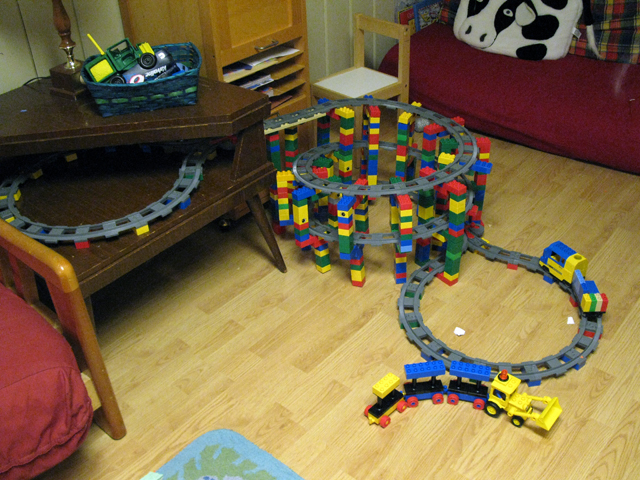 A single Duplo curved track spans on a 30° angle. Three such tracks make a right angle. But the simple staff ends here. Ever tried to connect the ends of such right angle with Duplo bricks? It failed, didn’t it? You could actually make it but that would require to strain those tracks a bit (they are significantly flexible so it doesn’t require any strength nor does it seem to make any breaking risks). If you would do that with a hole circle of 12 curved tracks you would not get a circle but an ellipse with short radius of 17 Duplo studs and long radius of 18 Duplo studs. The actual radius of a circle is somewhere around 17.5 Duplo studs. It might be aligned with LEGO studs, I haven’t checked that but I doubt it. This might seem insignificant especially that the tracks are strained so little that it is not visible to someone who “doesn’t know”. But still this is some disadvantage that shows when you try to build something bigger or mount everything on a single solid base (possibly done with plates). Since the strains add up and things start to fall apart easily. So I looked further wondering to what the curved tracks align well. Sadly without success. Another failed example is when you connect two curved tracks in opposite direction. That way the lines entering and leaving the two tracks are parallel. Its tempting to see if you can mount it on a plate. But as it shows again it is not possible. Such a connection of tracks does not align well with Duplo studs (and thus also straight tracks...). In my experience a train having two or three railcars significantly slows down on longer curves. The cars are long and wheels don’t turn around in no way which means that the do no align well with curved track and cause some friction. With more railcars you can see how the train slows down and sometimes even hear that. With four or more railcars its nearly sure the train will stop on a longer curve. Would the curve track have a larger radius this issue would be (somewhat) smaller. Now knowing the drawbacks of current curved track design we might wonder what are its advantages so that the trade off goes well. Anyone? And this is still not end to the questions. Why current locomotives do move in only one direction? Would changing the button to a three state switch (forward, stop, backward) make it much more expensive? Or would it be much more difficult for kids? Current sets with locomotives are from 2 years. How it was with the old “smart locomotive”? As I think it was far more “difficult” and “complex”. I find it rather odd that (current) Duplo locomotives don’t have anchors on both sides as all railcars do. This way making the locomotive push the train rather than pull is rather difficult and likely to cause derailment when using more complex layouts (like ups and downs or junctions). Tracks and the engine wheels of the locomotive are corrugated. Why is this needed? As it seems LEGO trains don’t use it. So why Duplo trains need it? And as a final question. (7) Does LEGO provide precise specification of their “bricks”? Like exact dimensions and sizes or power of motors and so on? what do you mean?... (grin) Click on the photo for other views of this layout. I don't completely follow your question, but the "current" duplo tracks seem to be designed to be mostly curved, including the switches, which are actually just a choice between curve left and curve right. I say "current" because I suspect Lego just discontinued the duplo trains. They have a new train set, but it just has the four wheel push cars like the ones off of the track at the bottom of the photo above (which happen to run fine on the track as long as you don't have any switches or what not). Also, Lego has revised the duplo track designs several times over the years. I don't think there is a good match, but with a few sections of track you can wiggle a few extra studs one way or the other. Duplo isn't designed for long trains (at least not the powered trains), maybe three cars max. If you have one of the bridges possibly only two cars (at least I think that is what the sets maxed out at). Presumably Lego figured young kids wouldn't appreciate long trains (never mind the fact that that is all my son wants to do) and they also wanted to keep the mechanical power low for extra safety. Somewhere I saw someone had built a PF XL motor powered locomotive for duplo track, that could probably pull more than a few cars. One way operation is cheaper, also they now have an automatic detection system to stop if they come off the rails (extra safety). I suspect making that auto stop function work in two directions would have been expensive and less reliable. I like the "glug glug glug" that the refueling port triggers, with features like that I suspect these were not designed on the cheap. The smart locomotives look cool and I've never actually played with one, but I suspect that system was way too complicated for the target age group. That fits with the one way operation. Though with a little finesse you can use two locomotives on a train with one at the front in normal operation and one at the back as a pusher. Probably borrowed from the 12v track. It gives a little extra traction. Regular lego trains have much lower friction in the wheels compared to duplo, so duplo needs the extra traction. Generally no, I don't think they do. But Philo has done an extensive comparison of most of the PF, train, and mindstorms motors (at the moment google is warning that his pages may be a risk, so google "philo lego motor" at your own risk). Two curved tracks are the exact same length as two straight tracks. This might explain some of the other design choices as well. The old Intelli-Train does operate in reverse. It works just fine so long as the train is not too long. The Intelli-Train was also multi-speed depending on the driver (one driver was a lead-foot, the other dottering), the state of the fuel tank, and the programming boards. Incidentally, it is a shame that the market didn't embrace the Intelli-Train. The thing is a blast for my kids. I have some of the old black Dacta track that lacks the corrugation. Most of the time trains do fine without it, but corrugation does reduce slippage, especially on the risers for the bridge. There appear to be two new Duplo train sets this year (10507 and 10508) but some changes may be afoot since the Lego store dumped the curved track pack (2735) last month. I really have no answers on your questions, and i wonder if you'll get them here, but i can imagine you are a bit annoyed. "Annoyed" isn't a good word here. I'm more "curious". Maybe a bit "disappointed". Young kids maybe don't. Their parents (for example me ;)) sometimes do. zephyr1934 gave you an example. On YouTube you can find many more (including few of my own). I don't think that it "isn't designed for long trains". I'm starting to think that instead designed against long trains. Railcars have fixed wheels (unlike LEGO trains...). This could be explained with lowering costs and making things stronger and harder to break. Sure. But why they are so long? While at the same time curves radius is rather small. And you noticed yourself (and I did see that myself too) that kids like to make long trains. The Duplo train can as well. But not on curves. Even bridge doesn't put that much limitation as do (longer) curves. Now if train pushes rather than pulls it is not connected with railcars. And this leads often to derailments on bridges, curves or switches. Adding a front connector would add a nice opportunity at least partially covering for missing backward move. 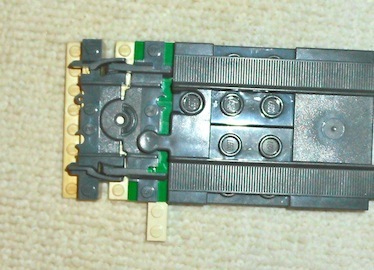 Note also that (manual) Thomas line locomotives had connectors on both sides of the locomotive. What is odd however is that they were opposite to what is now so if you would like to connect Thomas line engine to current locomotive it needs to go backwards. Well, the funny part is that they... don't! 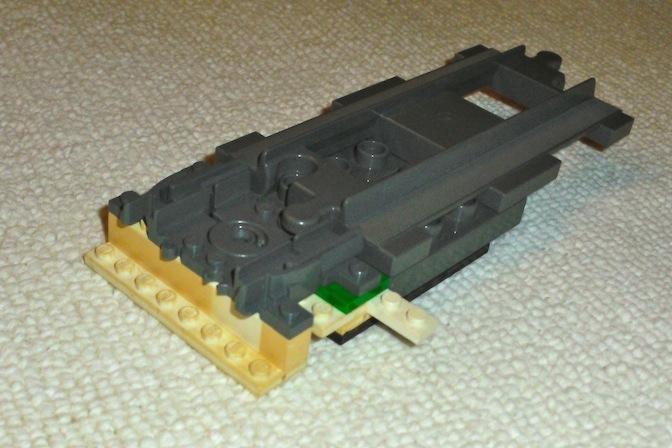 To see that yourself you have to mount the tracks on 4x2 bricks (or plates) so that they are not "flexible". Then you will notice that the two curved tracks are slightly longer than two straight tracks. I had a chance to play with it only once but it was already very old and used. Didn't work well anymore. Buying one now is very expensive and somewhat risky if you buy a used one. But I'm still hunting for one! I am curious to see the price of the deluxe set with that amount of track and a bridge! The information I have is $110 (USD) for 10508 and $45 for 10507. Hey, lego's bringing the duplo bridge back. That is interesting! But it seems tha page states the same (or close enough) questions and doubts that I had without providing much answers. (1) the radius used for curved tracks must have some reasons behind it. I don’t know which and I would very much like to know. My answer to that one is a guess, but I think it was mainly the need to make the figure-eight with rails (you call them tracks, but neither is a good word really, but we know what we mean: the track “unit” piece). As you can see from what I did with the plates under the connections, for some strange reason the curved track actually spans 30.3 degrees! And it is also slightly wider than the straight one. (2) Ever tried to connect the ends of such right angle with Duplo bricks? I suppose what you mean here is this: suppose there is an infinite grid of studs (knobs) that are “virtual”. Place the half-sleeper of one end of the right-angle set of three rails exactly on those studs, then the half-sleeper at the other end does NOT fit the studs. That is true indeed, and I have no clue why, other than that the curved rail is some compromise that allows building the figure-eight and also fits several other layouts that cannot be made exactly, but can be made because there is enough play. As the engineer that I am, I would probably make a number of “popular” layouts, calculate the curved track dimensions to do each of them, and then design a piece that, with some play, would work in all those layouts. The layout in the photo can probably not be made "rigidly", and relies on the play. The diagonal, projected on the other sides woud involve a cosine of 30 degrees, and that is not a rational number. What I do know is that the older rails, black (still for sale as used items on eBay), are the same width but have many disadvantages: they divided the circle in 8 instead of 12, and the sleepers could not fit on plates because the tabs were not raised above the studs. Their surfaces are also a little lower than the new ones. Using the method of forcing the half-sleepers to unite over a plate or brick, I come to 36.5 for the outer diameter. If you do not use that method, then the play in the connections (we really lack a vocabulary for naming the different parts of rails we are talking about!) will allow for a diameter of 2x18=36. (4) Another failed example is when you connect two curved tracks in opposite direction. That way the lines entering and leaving the two tracks are parallel. Its tempting to see if you can mount it on a plate. But as it shows again it is not possible. This problem occurs also in real trains. Over the length of a long car it is alleviated by the bogies on each end of the car that can turn around a vertical axis, but within the (very short) bogies the problem remains. The other kind of friction is caused by the fact that the wheels are fixed to the axles, and the outer wheel must go further than the inner wheel. That is the reason for supressing the ridges on the inner surface (point 5 on my page, traction) which unfortunately also leads to the locomotive slowing down somewhat and having less traction. In real trains the wheels are slightly conical, and there is 12.7 mm play between the rails and the wheel flanges (see point 2.). This play allows the car to shift slightly towards the outer rail in a bend, so that the outer wheel rolls on a larger diameter of its conical shape than the inner wheel which rolls on a smaller diameter. This is just sufficient to compensate the difference in distance travelled. In fact, original railways in mines had a rail distance of 4’8” (don’t ask where that silly number came from...) and this was no good for higher speed locomotive pulled trains for people, hence the addition of 0.5” and the standard rail gauge of 4’8.5”. Human silliness has no bounds. And even so, many trains screech when going through a bend because of the slipping of steel on steel (do not buy a house close to a railway bend). But Lego rails of course do not have this possibility of the conical wheels, so the inner wheel slips and causes friction. (6) Now knowing the drawbacks of current curved track design we might wonder what are its advantages so that the trade off goes well. Anyone? There I think I did give several answers: it had to be child-proof, withstand pressure on the wheel rims, be easy to put the cars on the rails, allow for use without rails, and so on. (7) Why current locomotives do move in only one direction? The older ones do have reverse, and can be programmed. I don’t know why this was stopped. (8) Or would it be much more difficult for kids? You touch a delicate point. I would say it would be too difficult for the parents. Sadly, we seem to be in a dumbing-down phase of everything, including Lego. I remember that when IKEA became popular, it was mainly because it was so EASY to assemble, and all I hear now is that people find it difficult! Yet IKEA has not changed its , so it must be people’s attitudes that did. (9) Current sets with locomotives are from 2 years. How it was with the old “smart locomotive”? As I think it was far more “difficult” and “complex”. I agree. Kids figure this out quickly, but parents are too impatient and dislike figuring things out. See also (7) and (8). (10) I find it rather odd that (current) Duplo locomotives don’t have anchors on both sides as all railcars do. I agree completely. However, going over a bridge might become more difficult if the train is pushed, as the rack-and-pinion design of hte locomotive’s driving wheels would not engage with the bridge (page about that to come). But that is a minor point. (11) Tracks and the engine wheels of the locomotive are corrugated. Why is this needed? As it seems LEGO trains don’t use it. So why Duplo trains need it? Because of the flat wheel rims, see also point 5. The other trains are designed like real ones and run with conical wheels on top of rails. I will soon put up a page on locomotive design. (12) Does LEGO provide precise specification of their “bricks”? I do not know, as I have been in direct contact with Lego only once, almost 30 years ago. In this day and age of companies making a wall between themselves and their customers, it will be difficult to get those specs. On the other hand, Lego must have filed patents on everything, and so perhaps I should try to find out what the European Patent Office has. This is hard work though... I have a lot of dimensions, from reverse engineering, and my info about it was/is on my old site. I’m converting it (slowly...) to the renovated site, but it will take some time. Have you got access to Adobe Illustrator, or to a good SVG editor? I could send you some of my drawings of parts. Otherwise, watch the Lego section, more will come over the next months. Perhaps one more thing: I have not yet finished a page on switches. They are different in dimensions from a superposed pair of curved rails. Maybe they have the original curvature. Writing to you has brought this up as a possibility, I will explore it. Things are being dumbed down. Thanks for your notes and time! Also the layout page: that is excellent (still have to read it to the end thou). I was thinking about those issues myself some time. But I was going into representing the layout as graph and then see how things look and maybe find some rules. Anyway I really admire your effort and work. It is nice to know that somewhere out there is someone playing with Duplo rails more than just "randomly". This topic seems to be unpopular, people use System rails instead. Likely I would have done so myself if not having too small children. And since I already invested in much Duplo (mostly rail) it will stay for some time at least. And I do have SVG editor. Anyway if you would like some help with those entries I could try to contribute whatever I can (likely not much sadly). It does not work with simple graphs, as it is directed. I still have not found a way to get ahead with graphs. I did consult a mathematician on the second problem. He did not get anywhere. However , we agreed (a) it is not a simple problem, (b) I found out it is a property of my algorithm and not at all of the topology or even that it has anything to do with switches. I'll publish on that soon too. I wrote a simple program in LiveCode to do the computation on any matrix, and my algorithm always ends in two steps, no matter which arbitrary set of cells one marks! Anyway I really admire your effort and work. It is nice to know that somewhere out there is someone playing with Duplo rails more than just "randomly". This topic seems to be unpopular, people use System rails instead. Likely I would have done so myself if not having too small children. And since I already invested in much Duplo (mostly rail) it will stay for some time at least. I found I needed more straight ones. If you have not tried eBay, do so. Nora is our granddaughter, the Duplo is "hers" when she comes to us. No. Well, you may ask via Google... I'm doing this site purely to be able to record some of my own thoughts, because writing them up forces one to think straight. And it serves also the purpose of being able to send a URL rather than having to write things again and again. OK. My e-mail address is robert@cailliau.org (don't forget the i after the double l.) Send me a message there, then I'll send you in reply the files I have as SVG files. I tried to use InkScape to do the editing, but I'm not yet good at it, it's still easier for me to use Illustrator's snapping and duplication tools. But I can save in SVG of course. I meant LEGO System Trains theme. When it comes to trains in LEGO the System ones get all the love while you will rarely find anything on Duplo ones. At least such is my experience. Hey! I might disagree with you on that. You get the bridge! This is a very interesting topic, thanks. You probably wouldn't get anywhere trying to contact Lego about this (they might think you were a bootlegger or something), but you never know; you might! Maybe they would find it interesting that someone was taking the time to try to dissect their work. I already replied to many of these questions a few months ago, but seeing these responses I have a few counter replies. 8 & 9) I would not blame the parents. I would blame marketing, toy companies are pushing more complicated toys to younger children. So the intelligent trains were probably targeted towards 6 yr olds (e.g., set 2745 from 1996 is 3-6, while the newer trains are 2-5). Now some of the city sets are marketed to 5 yr olds. Not unique to Lego though, e.g., I recall playing with fisher price little people until 5+, but by 3 our kids were tired of them. All of the traditional toy companies have to compete with the tablet and video game effects. Oh, and just try to find a G rated movie in the theater these days. It's not easy being young any more. 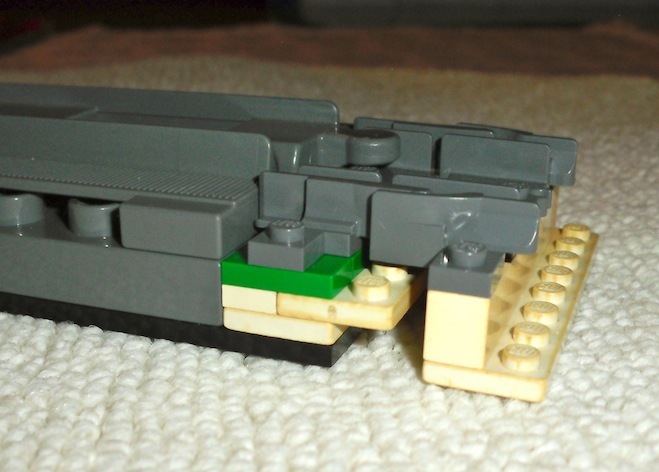 10) lego is bending backwards to idiot proof things. Put a coupler on both ends and it will cause problems, especially for a train that only goes one way. I think they have discovered that even if only 1% of the users are impacted, it costs more to let the problem linger- e.g., the finger nail groove added to jumper plates. 12) it used to be no, they did not, but lego is now providing some measurements to the LDraw community I believe. I saw your "second problem" I didn't take the time to understand the particular programming language, but I suspect you have a nested loop, so in one iteration you are extending more than one link. I suspect you are populating half of your matrix on one pass and then the other half on the second (but I don't have proof). One thing that you could do to your code is to track the number of links it takes to reach a specific point. So instead of populating your matrix with "0", use "0" for first reachable, "1" for after one link, "2" for after two links, and so forth. You were not pricing track. A year ago you could get 6 straight segments of duplo track for $5 from S@H. Only with the most recent release did they push the duplo track up to the cost of the regular track. I admit not reading everything in great detail when I posted my first item. I'll re-read. I could not agree more. Though I still believe parents have some responsibility in giving in to it all. Agree. It's a hard world for them too: people are never satisfied. But what grooves are you talking about? Jumper plates? Good news. They are only necessary for parts with weird shapes though, for normal bricks and connectors finding the dimensions is easy. I already came to that conclusion too, by watching the algorithm work: as it goes along line by line, each line that refers to a previous one gets the benefit of using what that one already found. Better even: as it progresses along a line cell by cell, the line gets benefits again. Finally, I made a version in which I can easily populate the original matrix with anything I like. To my great surprise (thoug in retrospect it should probably not have been such a surprise) I still got a stable result in two iterations. I.e. iteration 3 is always equal to iteration 2, independent of what I filled in. So the effect has nothing to do with railways or switches having only two exits or anything like that. It is purely a property of the algorithm. But so far I have not found a proof. At least I now know I should concentrate on the algorithm itself. Personnaly, I use more of an "experimental" approach and I make an heavy use of the mechanical play (or clearance ? sorry for my bad english) to close most of my loops. I never though about theoretical solution, until I saw this topic some months ago, and the posts by Robert today. Section 2 of Robert's analysis of rail dimensions ( http://www.cailliau....ils/Dimensions/ ) made me remember how I tried to connect Duplo and system tracks, with the goal of having system rolling stock running on Duplo tracks. I got a partially satisfactory solution (that I will post here). The APR problem is very interesting and usefull (how frustrating it is to have just completed a nice layout and observe that some points are visited only once...). I'll try to have a deeper look at it. I don't know if this is the best location for that, and I don't want to hijack the topic, so please tell me, I'll remove that and post it elsewhere. With in mind the idea to have System trains run on Duplo tracks (I have a lot of Duplo tracks) I faced several challenges. The first one being that old (I mean 80's) boogies won't touch the sleeper of Duplo tracks, because their axle is encapsulated in a brick which is too thick. Fortunately, recent (present PF at least) boogies have almost no plastic below their axle and there is enough free space so they can run on Duplo track. But System wheels are running on the flange of the rail on their System rails, while they have to run on their outer circunference on the Duplo tracks. which works pretty well with recent boogies. It is funny (although most probably not random) : the flexible track inner rails (not realistic at all) have the same spacing as the Duplo rails. So what I am seeing is the connection that lets normal tracks (system tracks) connect to Duplo tracks. I only have normal tracks from the time they had metal on them to conduct the electric power to the locomotive. That is no longer the case, so I'm out of my depth here. And my train would not run on Duplo tracks anyway since they need power. (a) has been solved at the price of putting the power in the locomotive. I don't know about (b), I have not looked at Lego trains recently. The auto-stop function is on the non-driven wheels. It is a simple tiny magnet fixed to the axle, that passes in front of a reed-relay that is monitored by the on-board "computer". If you run a loco, then pick it up but keep the front axle spinning with your fingers, the motor will not stop. You can spin the axle in either direction. However, a few weeks ago I had a set sent to a friend, and the loco in that set does not seem to stop at all when it is picked up or hits a wall. I wonder if this is a new feature or if that loco was defective on delivery. and  sets also have locomotives with green button but in instruction yellow button mentioned instead. 1. 2000-2006 years. there is no membrane between hitch and base and hook has opening with big diameter that allow simply connect two bases over hitch top. 2. 2007-2010 years. membrane between hitch and base added. looks like lego modified old molds as still duplo written in stoods. old one at left and new at right. and there is impossible now connect bases over hitch top. I'm not sure that hook better but as I own both ones it cause some problems for my son. also i did 90° track crossover using system bricks: fotos and video. ps: and I hate lego for  set. why they made train set with non-train bases? That is really crazy... If the child lets the locomotive runs under a piece of furniture, it will empty its batteries and damage its tyres before the parent can come to retrieve it. Stupid. Cute. However, you can buy a 90º crossover of the black, old style rails on the web, and it fits well, though the running surfaces are slightly lower down. Ah, well... Why not? It is a push train, not meant to go on rails. From separate bricks of the Duplo from 1982 of my daughter and the Duplo of 2013 of my granddaughter, we can build this "train" easily. It's not forbidden. In fact it will even run over Duplo rails too, though it will not go over switches. That said, I do agree with a more general remark that I will make here: there are too many different scales and types for certain objects. For example, there are at least three different scales for human figures in the normal Lego alone. Fortunately there is only one scale for Duplo. There are different scale doors, again at least three I think, for normal Lego. Technics has a number of problems that I have written about on my old site, and will comment more about on the new site (and that does not belong in this topic). Lego is also in direct competition with PlayMobil, and this can be seen in the evolution of figures for people and animals. As long as the shareholders do not become dictators of what goes and what does not, and the engineers have a good say in the final shapes of bricks, "we" are safe. However, "we" are, I suppose, all over 30 years old (I am 66) and the toy must remain accessible to the kids. So I fully agree with your remark about the changes to the wagon hooks: they are more difficult now than before, and I hate that. I do understand you are upset about 10558, but it's OK I think. But inside the company it must be difficult to make the necessary compromises. Many parents (a fortiori grandparents) have no idea what the kids really want, so they buy sets based on what they see on the cover. I remember when I was 11 years old: I had a Meccano set but no gear wheels. I asked my grandmother to give me a set of gears for Christmas. When I showed her the illustration of the box, which contained only gears, she laughed out loud and said: "What in heaven are you going to do with that? What is it anyway?" I did get the gears, and she never understood.